I've joined a book club. I said that I wanted to read something which I wouldn't normally choose and my wish was answered. 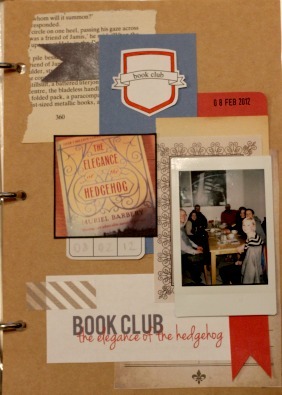 The book for the February meeting was 'The Elegance of the Hedgehog', it was written by a French author - Muriel Barbery and translated into English. It's quite philosophical and not an easy read. I had to look up at least ten words whilst reading it and I'd like to think my vocabulary is pretty good. I probably wouldn't have made it to the end if it hadn't been for the book club, but I'm glad I did, there was a lot more story towards the end. I mainly enjoyed meeting some new people. They were very welcoming and had some great insights into the book. I made a page in my scrapbook/journal about the meeting. It probably needs a bit more work, but I had fun putting it together. I'd like to keep a record of each book this way, though I don't how long I'll be able to keep it up. Yes, that's true. It's refreshing to talk to someone who has 'just' read the book as well. I often forget a lot of the details after a couple of months.